Jane Austen’s novel, Emma, has inspired numerous adaptations in the nearly 200 years since it was first published. The latest onscreen version, Aisha, is watchable, but its heroine misses the mark. In this modern Indian update, directed by Rajshree Ojha, Emma is renamed Aisha (Sonam Kapoor): a wealthy girl from Delhi who fancies herself an expert matchmaker. Her intrusiveness and inability to read people winds up complicating the lives of all around her. Of particular interest to Aisha is Shefali (Amrita Puri), a small-town girl who’s looking for a husband. 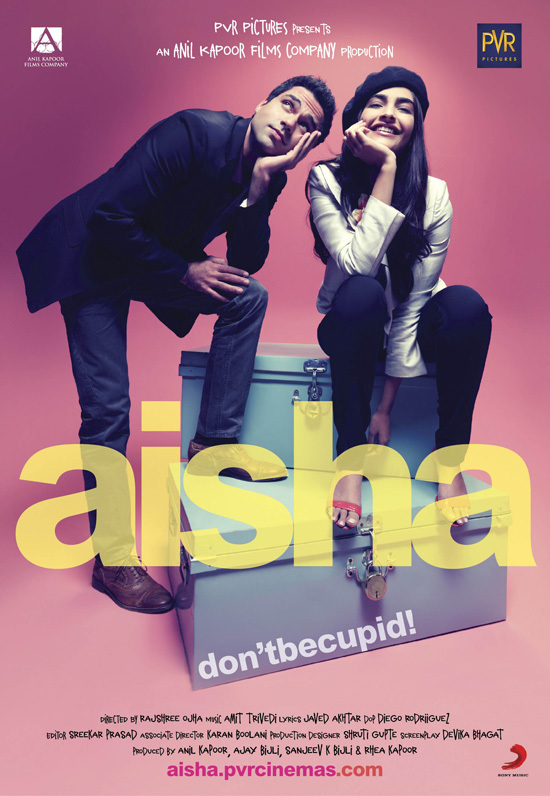 Shefali presents a convenient means for Aisha to rid herself of her own dorky suitor, Randhir (Cyrus Sahukar). She sets about trying to force the two to fall in love, with disastrous results. Debutant actress Puri does a lovely job as Shefali. She’s desperate not to disappoint Aisha, yet incapable of becoming the society girl she’s expected to be. The earnestness and excitability Puri brings to the role is spot on. American filmgoers will find Aisha very accessible. The characters’ addictions to trendy fashions and designer labels is universal among young people with money to burn. The story is structured like many Hollywood movies (though it’s occasionally bogged down by the song-and-dance montages unique to Bollywood). A familiar story helps as well. Emma Woodhouse is an enduring character because of her complexities: supreme self-assurance paired with a lack of real world experience, a compassionate nature mixed with uncontrollable nosiness. Like Emma herself, Sonam Kapoor lacks the experience to make Aisha an appealing leading lady. Kapoor plays Aisha as woefully immature, to the point that she seems like the lone adolescent in a world full of adults. In the movie Clueless — another modern remake of Emma, from 1995 — the main character narrates the movie. It allows the audience to hear her thoughts, testifying to her change of character. A similar technique would’ve been useful in Aisha. Despite a lackluster heroine, Aisha has a great supporting cast. In addition to Puri’s solid turn as Shefali, Abhay Deol reaffirms his rising star status with a charming and authentic performance as Arjun, Aisha’s long-time neighbor and friend (the George Knightly role in Emma). The character who undergoes the most emotional growth throughout the story is Aisha’s best friend, Pinky (Ira Dubey). Pinky begins the movie as Aisha’s cynical sidekick, snobbishly looking down upon everyone but Aisha. There’s a moment when she realizes that she’s been too hard on Randhir, and it changes her outlook on life. Too bad Aisha didn’t experience such growth herself. This entry was posted in Reviews and tagged 2.5 Stars, 2010, Abhay Deol, Aisha, Amrita Puri, Bollywood, Clueless, Cyrus Sahukar, Emma, Hindi, Indian, Ira Dubey, Jane Austen, Movie Review, Rajshree Ojha, Sonam Kapoor on August 8, 2010 by Kathy. http://www.hindustantimes.com/Mayank-Shekhar-s-Review-Aisha/H1-Article1-583151.aspx and then this one is all gushing & glowing http://timesofindia.indiatimes.com/entertainment/movie-reviews/hindi/Aisha/moviereview/6261844.cms Yours is moderate. Love your reviews…! Thanks for your kind words, Ramesh. And thanks for the links, too. Interesting to read such different reactions to the same movie.